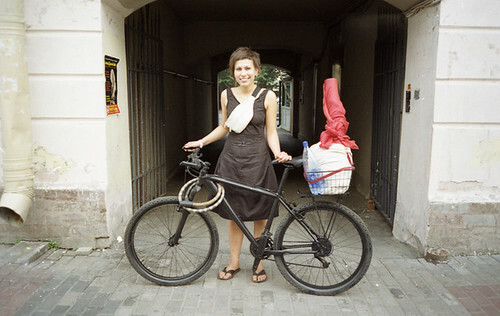 Cycle Chic in Saint Petersburg, Russia from spitsbergen on Flickr. Gustar: there are two ways. The first you simply lean the bike to the side which lowers the top tube enough that you can step over it. The second, used mostly by those who like to live life with a bit of a flourish, is to swing your legs over the handlebars rather than the seat. True, though as I could be their mum, I'd far prefer the second girl's bike.